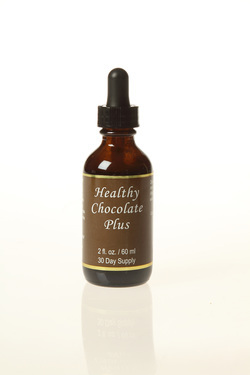 CHOCOLATE PLUS (HEALTHY) EXCLUSIVE TO US!! ​Mother nature lends her finest ingredients to promote alertness and energy while helping to calm you, satisfy cravings, feed your brain, helping you to focus, and lift your spirits. Exclusive to FREE-MART – you can only find this incredible formula here! Now a powerful brain-food that helps to satisfy cravings by feeding your brain with all-natural nutrients that your brain may be starving for, disguised as a decadent chocolate elixir. It’s a proprietary formulation of natural nutrients that turn on the normal functions of the brain enrobed in decadent chocolate elixir specifically designed to target the pleasure center of your brain. A dropper full of this liquid gold gives you a rich chocolate burst that will satisfy the deepest cravings, but that is just the surface. This chocolate contains a blend of incredible ingredients with amazing properties. The combination works naturally with your brain chemistry to both energize and calm you. When you feel stressed or frazzled, your brain is lagging or a little bit fuzzy – a delicious dropper of chocolate will help to lift and focus you. Chocolate Plus is the chocolate that loves you back! Kosher Vegetable Glycerin, Gold Water, Cacao, True Cinnamon, Vanilla Bean, Velvet Bean, Green Arabica Bean, Cayenne, Proprietary Blend of Mineral Salts. Since I started taking the Chocolate Plus I have noticed an improvement in my eyesight which is very exciting. I wear bifocals for distance and closeup readiing. I am not wearing my glasses for distance currently but still need them for closeup reading but that is improving too. At my health club there is a bank of TV’s which have closed caption since they keep the sound down and I can read the dialog without my glasses. I feel like I look younger without my glasses. Several people have asked me where my glasses are and this gives me an opportunity to share Free-Mart. From our “Free-Mart” conference calls I heard about The Chocolate Plus and how members were Excited about the amazing results they were receiving from this product. So I decided to give it a try and I am so Glad that I did! I’m typically not a morning person because of always having that morning brain fog or grogginess and having to drink cups of coffee just to wake up, which often took 2 or 3 hours, but not anymore. Thanks to The Chocolate Plus! I am sleeping better, I have more energy throughout my day, I feel a lot more refreshed and so focused in the mornings. Just Amazing!! It has a nice smooth chocolate taste too..Now I can give up that coffee..I am giving the Chocolate Plus 5 stars because what it has done to help improve my morning lifestyle. Thank You Free-Mart. I feel so blessed from having this product!